The theme for this month's Mixology Monday is Smoke - which immediately started the cocktalian part of my mind running. Smoke has been everywhere this past year, from liquors to lemonades, to the hills here in Southern California(! ); smoke in its many forms has been front page news. For me, smoke is also a transitional element: it symbolizes the last summer bonfires, sitting around the fire pit making s’mores, and the start of the fragrant crackles from the fireplace announcing that fall is coming. For September’s theme, I’d like to see how you interpret smoke. With your liquor or ingredients? Your glassware? 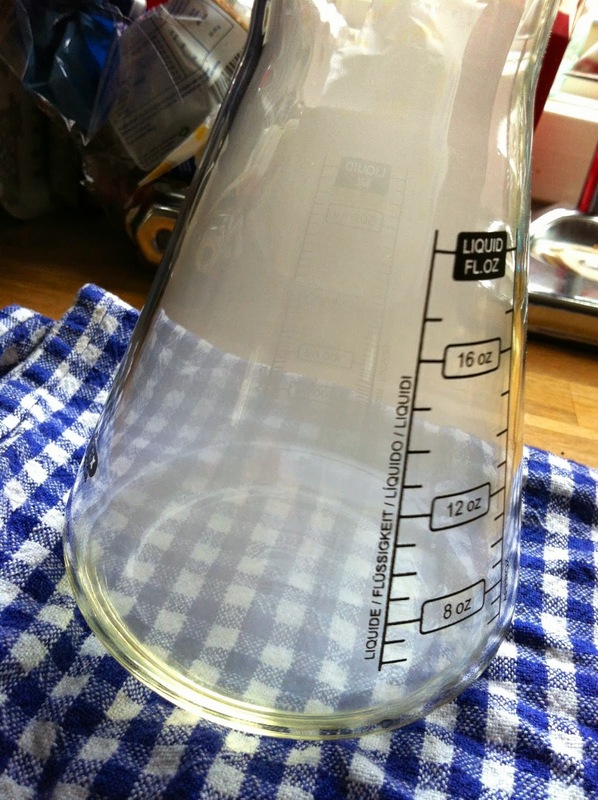 Will you whip out a chemistry set to transform your cocktail into ghostly vapors? Do you own a home smoker, still in the box, that’s never been used? Well then, you’re welcome. Unpack those ideas and let’s set off a couple smoke alarms this month for MxMo. I really didn't set out to, but this month's submission brings together quite a lot of the last MxMo themes. Also Elana challenged me further by announcing on Twitter, that her submission would incorporate locally distilled spirits. So I thought long and hard and came up with the Gefion Sour - named in honor of a goddess who plowed the island I live on in Denmark out of the middle part of Sweden. The "lost land" is now a lake. Most of the ingredients in the Gefion Sour are from Sjælland or Lolland an island just south of Sjælland. The lemon however is from far away. The basis - and where the theme comes in - is a lovely dill aquavit from Shumachers, just a 15 minute drive to the northeast of where I live. The aquavit has a very clear and crisp dill taste - it's made by extracting the fresh herbs in clear spirits - and a tiny bite of white pepper. And it is also certified organic. I lavender smoked a deciliter using the same technique I described here - that was a cocktail inspired by MxMo LXVI. The lavender was grown right in my own garden. Next I used the rest of my horse radish sirup from Hot Rod and finally I did a float sink of a completely new product: New Nordic Cherry Liqueur a wonderful alternative to Cherry Heering - thus tying into the cherry theme of MxMo LXIV. Shake the first three ingredients with plenty of ice, strain into an ice filled rocks glass and then gently pour the cherry liqueur on top of the drink over the back of a spoon. In my case the liqueur sank like a rock but the drink still turned out pretty. My cocktail is obviously a riff on New York Sour - where red wine is floated on the top. I may just not have the right touch - or the difference in the proof of wine and liqueur may be the explanation. I'm really pleased with this cocktail - the lavender smoke blends so nicely with the dill, the lemon, the cherry and a whisper of horse radish. I'll definitely be making it again. 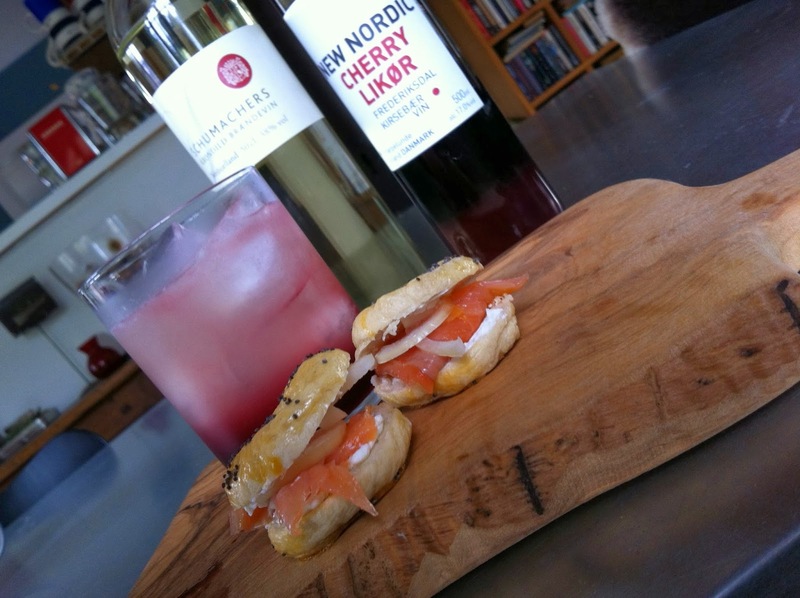 And since I knew this would be an early afternoon drink and I was baking bagels anyway I had fun baking some miniature bagels to turn into snack with a garlic cream cheese (the garlic grown locally), onion and SMOKED salmon.